In sailing, the great capes are the three major capes of the Southern Ocean — the Cape of Good Hope (although sometimes Cape Agulhas is cited in its place), Cape Leeuwin, and Cape Horn. South East Cape of Tasmania and South West Cape at the southern tip ofStewart Island/Rakiura are also sometimes included as major landmarks of a circumnavigation. 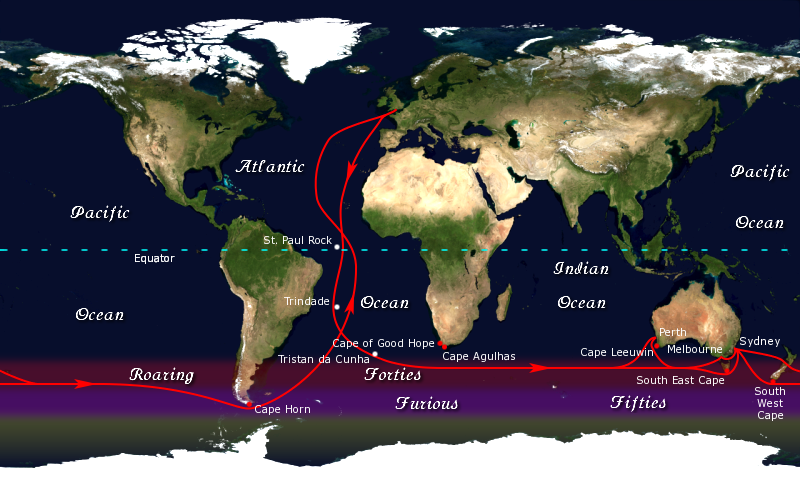 The traditional clipper route followed the winds of the roaring forties south of these capes; due to the significant hazards they presented to ships, they became significant landmarks in ocean voyaging. Today, the capes feature prominently in ocean yacht racing, with many races and individual sailors following the clipper route. Acircumnavigation via the great capes is considered to be a noteworthy achievement. A sailor's geography is not always that of the cartographer, for whom a cape is a cape, with a latitude and longitude. For the sailor, a great cape is both a very simple and an extremely complicated whole of rocks, currents, breaking seas and huge waves, fair winds and gales, joys and fears, fatigue, dreams, painful hands, empty stomachs, wonderful moments, and suffering at times. A great cape, for us, can't be expressed in longitude and latitude alone. A great cape has a soul, with very soft, very violent shadows and colours. A soul as smooth as a child's, as hard as a criminal's. And that is why we go.